“TerraGraphics extraordinary commitment to community service has led to them becoming a top provider of STEM Like ME! volunteers in our region. TerraGraphics employees are creative, dedicated and make a huge impact on our students,” reports Deb Bowen, STEM Network Director. The opportunity that comes with a great STEM education is clear. From gaining the critical skills and knowledge needed to thrive in the 21stcentury economy, to solving problems in your own backyard, STEM is essential to every student’s future success. What’s not always clear is the path from STEM student to STEM professional. That’s where TerraGraphics and the Mid-Columbia STEM Network come in. 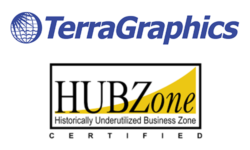 TerraGraphics is a locally owned HUBZone Small Business that provides a wide range of technical support to projects throughout the western US, including the U. S. Department of Energy (DOE) Hanford Site. They specialize in electrical, mechanical, and structural design, field geologic and archaeological services, and many other STEM intensive services. TerraGraphics has thrived throughout their 34 years in operations. In 2013, TerraGraphics opened an office in the Tri-Cities and has experienced substantial growth and they know that their local community is a big reason why. The Mid-Columbia STEM Network has been a pioneer in creating STEM education opportunity in the Tri-Cities area through bringing together the necessary partners of business, education, and the community at large. This coalescence of stakeholders had led to transformational STEM experiences such as STEM like Me, a career connected learning experience that pairs middle school students with industry professionals through hands-on career exploration. “TerraGraphics extraordinary commitment to community service has led to them becoming a top provider of STEM Like ME! volunteers in our region. TerraGraphics employees are creative, dedicated and make a huge impact on our students,” reports Deb Bowen, STEM Network Director. President of TerraGraphics, Dave Legard, has made community giving and investment around STEM a core part of their business which is why they continue to maintain the federal designation of being a HUBZone-certified small business. What this translates to is a commitment to hiring and supporting employees from historically and economically disadvantaged areas within our community. But TerraGraphics knew they could do more. When it comes to creating the opportunity that Washington students are so deserving of, it often takes a village to get them to that point where they can take charge of their own future. The partnership between TerraGraphics, the Mid-Columbia STEM Network, and the greater Tri-Cities community is an example of what that village looks like in the 21stcentury.